every international marathon. Every marathon in Europe, Asia, Africa, Australia, South America. international marathon for 2010 and 2011, but if you find a marathon we are missing, please use the submit button below to tell us about it. links to other running organizations . Find a marathon near you or plan a trip to one far away. We are here as a service to runners and those who support them. 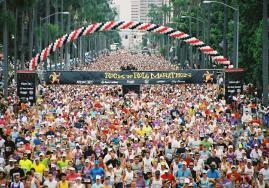 Let us help you achieve your marathon goals! always go too far for your body. You must handle the pain with strategy...It is not age; it is not diet. It is the will to succeed." PR in your next race.